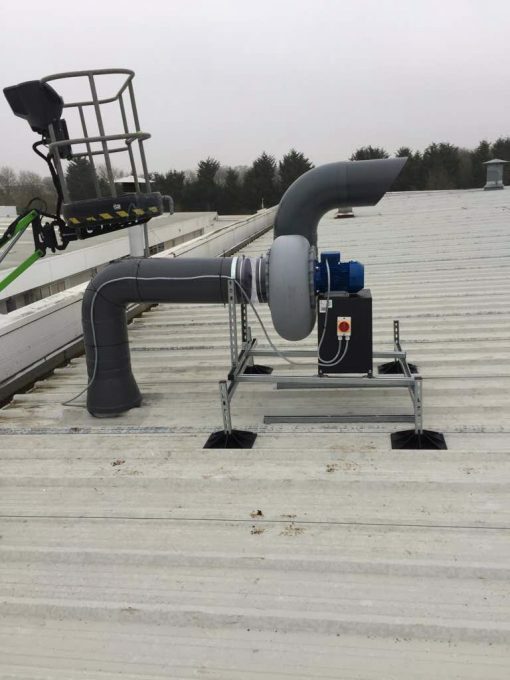 Fumetec was recently approached to remove a fan unit that had broken down at a prestige company in Oxfordshire. Our scope of work involved; 1) Remove existing extract fan unit from the existing unistrut rails. 2) Cut back the existing 315mm ductwork. 3) Supply and fit new ‘big foot’ system to support new fan unit. 4) Modify the existing 315 Dia pvc duct to suit fan inlet position. 5) Re-fit existing stack on the outlet side of the fan unit. This work was completed within one day including travelling from our Manchester base.